The New Look was the name given to a style of women's clothing launched by Christian Dior in his first haute couture collection presented in Paris on 12 February 1947. The styles that made up the look corresponded, according to the show's program, to the shapes "8" and "Corolla," respectively described as "clear, rounded, bust emphasized, waist indented, hips accentuated," and "dancing, very full-skirted, tight-fitting bust, and narrow waist" (Musée, p. 131). At the end of the show, Carmel Snow, editor-in-chief of Harper's Bazaar, is said to have inadvertently named the style by saying to Christian Dior: "Your dresses have such a new look" (Cawthorne, p. 109). The English term was then adopted without translation by the designer himself and by many commentators in the form "New Look" or "New-Look." Christian Dior used it to define his own style between 1947 and 1952: "1952 began in solemnity … the euphoria of the New Look was finished" (Dior, p. 178-179). However, the term is more broadly applicable to all the creations inspired by Christian Dior's first collections, both his own and those of his famous or anonymous imitators. This is true regardless of the date. The New Look, a watchword in the 1950s, particularly in haute couture, had striking stylistic repercussions at least into the 1960s. It was not until 1970 that Yves Saint-Laurent dismissed the style as a thing of the past with his fall-winter 1970-1971 "Liberation" haute couture collection that celebrated the aesthetic of the World War II years that the New Look had fought against. There after considered a historical style, it still inspires contemporary work that periodically quotes it (Jean-Paul Gaultier in particular) or pays it true homage (Yohji Yamamoto, "homage to French couture" collection for spring-summer 1997). 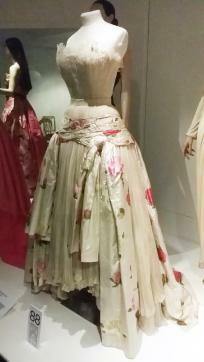 The New Look had multiple origins: the collections of the period immediately before World War II already hinted at a return to fullness in Balenciaga, Mainbocher, Lelong, and Piguet, which returned beginning in 1946; theater and film during the war revealed a clear taste for the Belle Époque and long dresses in general. The basque created by Marcel Rochas in 1942 finally opened the way to emphatic stylization of the torso. But Christian Dior was responsible for the formal, structural, and stylistic definition of the New Look, and for its economic and social impact. In terms of form, the New Look was constructed with reference to the individual garment as a reaction against wartime style. The voluminous and composite hats in fashion in Paris under the Occupation were supplanted by those with a "deliberately simple" silhouette (Musée, p. 131). Broad shoulders were replaced during the day by the sloping profile of raglan sleeves, and in the evening by bustiers. The loose-fitting style was rejected in order to reveal the structure of the breasts. 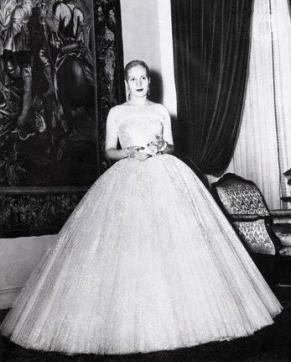 The waist remained fitted, very often belted, to emphasize the contrast between the new width of the hips and the flare of the skirts that, "definitely lengthened" (Musée, p. 131) in the spring of 1947, and by the following fall "reached unlikely dimensions and this time went down to the ankles" (Dior, p. 49). From the spring 1947 collection, the history of fashion has preserved the styles of the "Bar" suit and the "Corolla" dress as manifestos of the New Look, reminding us that the style affected suits constructed by tailors as well as looser garments draped by dressmakers. For the wardrobe, the New Look marked the triumphal return of the long evening dress, which the war had replaced with short formal dresses. By restoring very visible gradations between daytime clothing and evening dress, the spotlight thrown on evening gowns lastingly reestablished the fashionable dress code. Structurally, the New Look was built on choices of material and technical procedures aimed at sculpting contours: "I wanted my dresses to be 'constructed,' shaped on the curves of the feminine body and stylizing those curves" (Dior, p. 35). Fabrics were chosen for their solidity, accentuated by lining them with percale or taffeta. In 1952, for example, Harper's Bazaar saw the "Cigale" style as "a masterpiece of construction" and described its watered ottoman fabric as "so heavy that it looks like pliant metal" (Martin, p. 107). Dresses were conceived as multilayered compositions supported by underpinnings, including underwired bustiers and tulle and horse-hair skirts. The body itself was, if necessary, artificially shaped by the use of girdles and basques, or by recourse to flattering padding. These artifices, modifying shape as well as bearing, characterized the fashion of the 1950s with an ultra-feminine and affected aesthetic. In counterpoint to the tendency toward simplification and lightening, which sums up the evolution of fashion from the 1910s to the 1940s, the New Look seemed in 1947 to be an anachronism. Of his second collection (fall-winter 1947-48), even more emblematic than the first, Christian Dior conceded that the "sumptuous fabrics, velvet and brocade, were heavy, but who cared!… Abundance was still too much of a novelty for people to reinvent a snobbism of poverty" (Dior, p. 49). Considered backward-looking and extravagant, the New Look offended popular sensibility in the immediate postwar period. While the French press was indifferent or favorable to the style, it found enthusiastic support in the United States (Life, Vogue, Harper's Bazaar). For his very first collection, its creator was given the Neiman Marcus Award, indicating the serious commercial involvement of American buyers. A segment of the Anglo-American press, however, conducted a kind of populist anti-New Look campaign. Leagues were established in the United States against the lengthening of skirts, such as WAWS (women at war against the style) and the "little below the knee club." In England, the opposition took on a political flavor: "The long skirt is a caprice of the idle rich" (Braddock, Bessie, quoted in Steele, p. 20). These unexpected repercussions of the New Look testify to the rigor of clothing restrictions during the war. Imposed more or less drastically as part of the war effort on the American and English populations in order to contribute to victory, privations were experienced in France as despoilment by the occupying forces and had nothing of the character of patriotic sacrifice. The postwar period saw the victory of the independence of the New Look over the morality of the allies. Both liberating and respectful of custom, the style surprised and comforted bourgeois conventions. Thus, it quickly made headway in all social circles in Latin and Anglo-Saxon countries to become an international style, the popular interpretation of which was summed up in the ensemble of pleated skirt, belt, and blouse. Its diffusion was then the consensual expression of the construction of a new transatlantic social order on the ruins of European urbanity: "If I dare to refer to the style of 1947, which was called the New Look, it was successful only because it fit in with a time that was trying to escape from the inhuman in order to rediscover tradition" (Musée, p. 14). See also Christian Dior; Haute Couture; Paris Fashion. Cawthorne, Nigel. Le New-look / la révolution Dior. Paris: Celiv, 1997. Christian Dior, ed. Christian Dior et moi. Paris: Amiot-Dumont, 1956. Martin, Richard, and Harold Koda. Christian Dior. New York: Metropolitan Museum of Art, 1996. Musée des Arts de la mode. 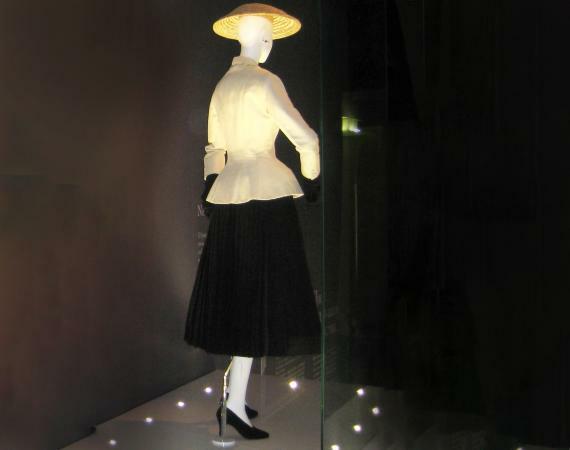 Hommage à Christian Dior 1947-1957. Paris: Union centrale des Arts décoratifs, 1986. Remaury, Bruno. Dictionnaire de la mode au XXème siècle. Paris: Éditions du Regard, 1994. Steele, Valérie. Se vêtir au XXème siècle. Paris: Adam Biro, 1998. Veillon, Dominique. La Mode sous l'Occupation. Paris: Payot, 1990.